70+ channels, including Sky News, BBC One HD, ITV HD, Dave and more HD channels. Also NEW channels: Sony movie channel, Movies4Men, Talking Pictures, Pop, Tiny Pop, True Movies, Sony Crime, PBS America. 500GB TiVo box - pause, rewind and record TV. Includes Virgin’s TV Anywhere App - watch 30+ channels on the go (register up to 2 devices). Features Netflix (account subscription required). SuperFibre 50 broadband included - Virgins fastest WiFi hub + Talk Weekends - unlimited and inclusive calls to 0870 numbers. 500Gb storage -pause rewind and record up to 250 hours of TV. Record 3 shows at a time while watching an existing recording or streaming from apps including YouTube and Netflix (subscription required). Search across live TV, Catch Up, Box sets and Netflix. 150+ channels, including Sky 1, Sky Living, Sky 2, Sky Sports, MTV, FOX and more, including HD channels. 500GB TiVo box - pause, rewind and record TV. Includes Virgin’s TV Anywhere App - watch 30+ channels on the go (register up to 2 devices). Features Netflix (account subscription required). SuperFibre 50 broadband included - Virgins fastest WiFi hub + Talk Weekends - unlimited and inclusive calls to 0870 numbers. 70+ channels including BT Sport, superfast fibre broadband with average speed of 54MBps and Phone. One of the most versatile and popular providers of in-home entertainment on the UK market - Virgin Media is a flexible service provider that offers TV, broadband, and home phone services. Virgin offers an incredible range of entertainment options, from broadband, TV and phone bundles that provide affordable solutions for all of your needs, to individual services that can be tailored to suit your specific preferences. There’s even an option to add mobile phones and SIMs into the mix too. However, with so many fantastic solutions to choose from, where can you start when it comes to comparing the various Virgin Media TV deals, and packages available? How do you know which solution is best for you, and your family? What is Virgin Media and what do they offer? Virgin Media is a British company known for offering mobile and fixed telephone services, television bundles, fibre broadband services, and more to consumers and businesses across the nation. 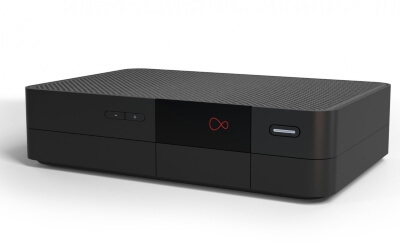 Loved by millions for their incredible range of high-quality entertainment channels, cost-effective packages, and reliable broadband connections, Virgin Media have emerged as a firm favourite for all-in-one home entertainment and communication services. The company was first formed in March of 2006 through a merger of Telewest and NTL, and was initially known as NTL:Telewest. In April of that year NTL:Telewest purchased Virgin Mobile, and in February 2007 renamed itself Virgin Media. It became the very first quad play company in Britain - one provider which offered a combination of mobile phone, fixed-line telephone, broadband, and television services. One of the most exciting aspects of Virgin Media is that it operates its own network, using a combination of high speed fibre and coaxial cable to deliver the fastest speeds of any nationwide mass-market provider. On top of that, the company allows consumers to choose between a range of different and customisable products that can help to ensure that they get the best deal for their individual entertainment. From Virgin TV and broadband packages, to broadband without line rental, the company is a beacon for home innovation. What deals and TV channels does Virgin Media offer? Virgin Media TV deals can include access to a number of different packages. Most of the Virgin Media TV bundles ocan either be taken alone or alongside phone and broadband as part of a bundle deal. In their top package, Virgin currently offers more than 245 channels, with access to fifty HD channels too. The most basic bundle offers a collection of 70 channels, but you can choose to add to that with extras such as Sky Cinema, Sky Sports, and more. What Virgin Media Bundles are available, and what do they include? The Player Bundle - 70+ channels, Superfibre 50Mbps broadband, unlimited weekend calls, unlimited downloads, catch up TV and a 500GB TiVo box. The VIP Bundle - featuring everything from the Full House bundle, plus Sky Cinema and Sky Sports channels, 1TB TiVo box and an additional 500GB TiVo box for another room. What is the Virgin TiVo TV box, and does it include multi-room viewing? 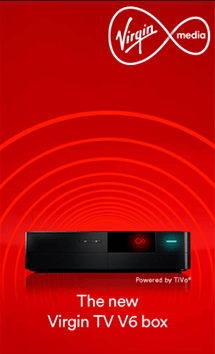 If you enjoy watching TV in multiple rooms throughout your house - or you simply want to make sure that everyone in the family has the same access to great virgin Media TV deals, then extra TiVo boxes may help. 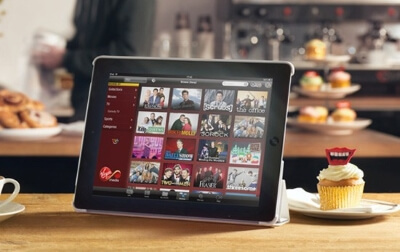 With the multiroom service, Virgin users can get up to five extra set-top boxes. 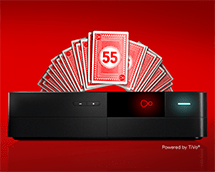 To use Virgin multi-room all you need to do is decide whether you want the 500GB TiVo box, or the 1TB box, then link up the system to a television in your chosen room. The 500GB TiVo box should allow you to record around 250 hours of standard TV, or 50 hours of HD TV. On the other hand, the 1TB box doubles that capacity, with 100 hours of HD TV and 500 hours of standard TV to browse and view at your leisure. Alongside a multi-room subscription, this will ensure that you can browse all of the channels you have as part of your Virgin TV subscription from any room in the house. This system also means that you can watch all of your favourite On Demand shows in the bedroom, kitchen, or den - including apps and catch-up TV. What are my options ofr Virgin TV and broadband bundles? When it comes to broadband, Virgin Media offers some of the most impressive options around. Whether purchased separately or part of one of the many virgin Media bundles on offer, customers can access incredible speeds. The Virgin Media broadband network uses fibre, with coaxial cable completing the connection into homes (hence why Virgin used to be known as cable broadband and TV). Depending on the coverage in your area, you could be eligible for either 50Mb or 100Mb and 200Mb VIVID services. Each package comes with unlimited downloads - which is excellent for those who like to stream HD movies and television straight to their computer screen. What’s more, even the lowest 50Mb broadband option is more than twice as fast on average than ADSL broadband services. Virgin Media even offer a VIVID 200 Gamer subscription, which combines a phone line contract with totally unlimited broadband. At present, VIVID 200Mb is more than twice as fast as the best BT Openreach fibre broadband packages - making it the ideal solution for busy households, gamers, and 4K streaming. Perhaps one of the most exciting features of the standard Virgin TV and broadband packages, is that they can be accessed without a landline. In fact, Virgin is the only nationwide UK provider that allows you to sign up for an internet connection without a landline. Check our our guide to see if you can get Virgin Media in your area. Can I get a Virgin Media phone line? Talk Weekend, included as standard with most Virgin Media bundles and offers unlimited weekend calls to Virgin mobiles and UK landlines. Talk More Weekends, which includes calls to 0845 and 0870 numbers. Talk More Evenings and Weekends, which upgrades the Weekends package to include evening calls. Does Virgin Media TV include any extras? Part of what makes Virgin Media so popular as a home service provider is that they are willing to offer their subscribers a range of added extras. From unlimited downloads as standard with any broadband package, to free catch-up and on-demand services with their channel bundles - Virgin are all about giving you a great deal. Most of their standard entertainment packages come with a TiVo box that allows you to pause, rewind, and record live television, and you can upgrade your package to include extra boxes for a nominal fee too. On top of that, Virgin users can get access to the TV Anywhere app, which allows them to view their virgin Media subscription from just about any device that has a Wi-Fi connection. TV Anywhere lets users watch their favourite shows on a range of devices, including Android and Apple smartphones, Apple iPads, PC and Mac desktop and laptops and the Amazon Kindle Fire tablet. From a computer, users can watch various live TV channels, or catch up on thousands of hours of on-demand entertainment with a broadband connection. At the same time, they can also manage their TiVo boxes, arrange recordings, and delete previous recordings that they no longer want. From a smartphone or tablet computer, Virgin Media users can access TV Anywhere to watch over 100 live channels, explore new TV shows, manage their TiVo box, and more. You can even set your tablet or smartphone up to act as a remote control for your TiVo box.